All 11 new prints from the previous two posts are now available through the post. Each print is £65 + P&P. It’s cheque only, so please contact and we can arrange the details of the order. The first of two posts showing the prints that will be available from the exhibition at The Artist; please see previous post for details. 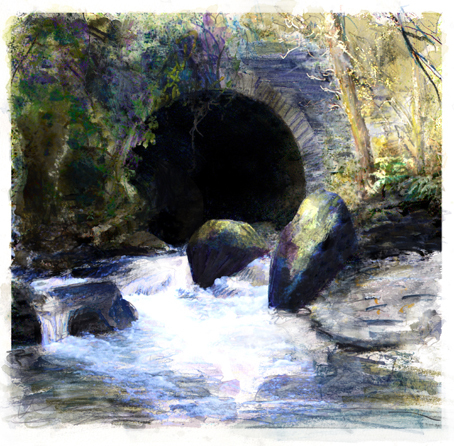 To Start with we have ‘Rocks, Ballaglass Glen’, a powerful evocation of lower Ballaglass. The light filtering through to the smouldering colour of a bank awash with leaves. Ravishing autumnal glory, never fails to delight. 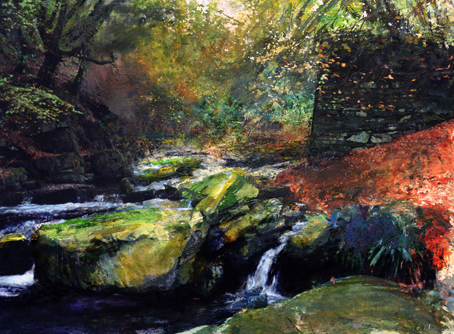 Next up comes ‘Bridge, Ballaglass Glen’ a perennial favourite in terms of subject matter. The gorgeous trudge through the glen is neatly topped off by the visit to see the bridge and its attendant boulders, trees and shaggy ivy, all giving witness to the river in good flood after a heavy rain. ‘Waterfall Montpelier Glen, Druidale’ with its tangle of boughs leading us over the pool past the waterfall, on to the mellow light behind and back around again. 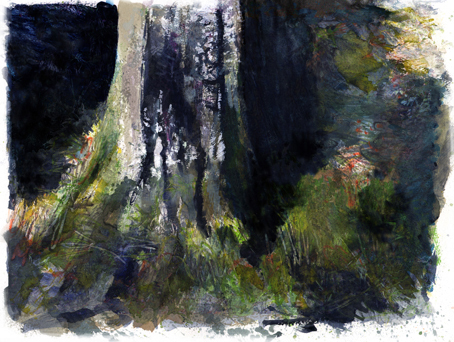 Back to Ballaglass for ‘Tree Bole, Ballaglass’. A close in view of the base of a tree trunk, nestled in to the cliff. All lichen smattered and mossy green lit brightly against the inky backdrop of the cliff behind. A picture for those folk that like their natural textures up close. Last up is the ‘Tree, East Baldwin Valley’. 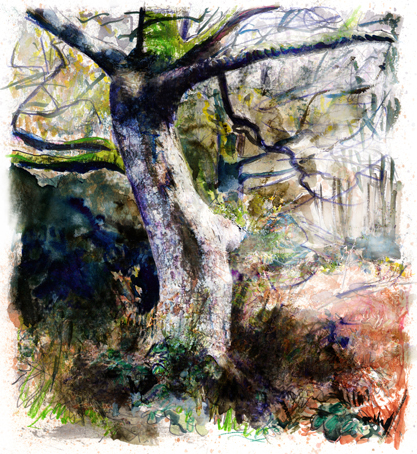 Now this tree has more than a touch of Faery about it! A little of the Little Peoples faery glamour must have rubbed off onto my brush in this painting. The seasons transitions are all special. The wild winter, the joy of spring, a balmy summer but to me nothing beats autumn. 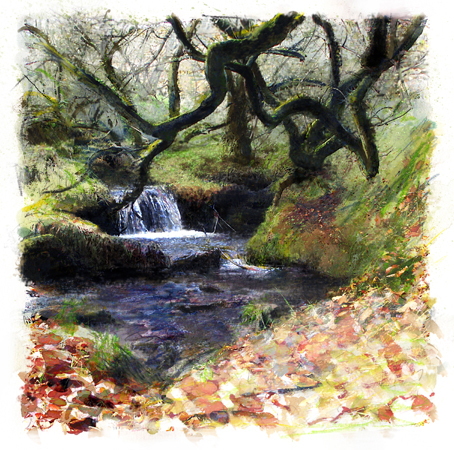 The magic of autumn through and through is truly grist to the mill of this painter. 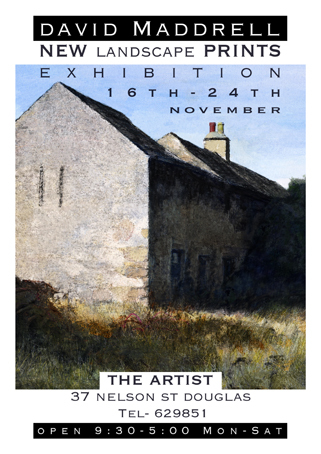 The second and final post of the new prints available at ‘The Artist’ exhibition running from the 16th – 24th of November. Please see previous posts for details. 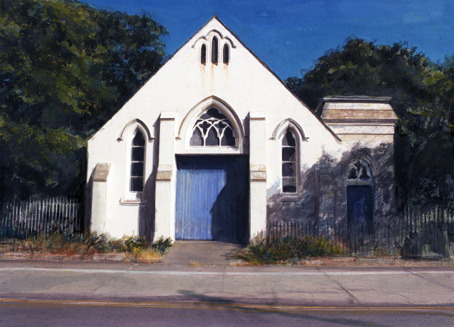 Up north for a start with ‘Old Church Building, North Shore Road, Ramsey’. This building really shines out with its pyramidal gable elevation. The side porch is almost like a curtailed tower; it may well have been designed to house/elevate a water tank. The white buttresses flanking the square of the doors painted blue make a great setting. It’s as if the building is a mould which the sky has been poured into. Even the ribbon of scruffy, bleached weeds that edge the pavement has a positive effect, running parallel with the yellow lines on the road. All this adds up to a dramatic symmetry of colour and composition. Great little building. Nothing much changed though the mixed media has brought out a different character, less pristine 50s retro feel. A little more grounded and real somehow. 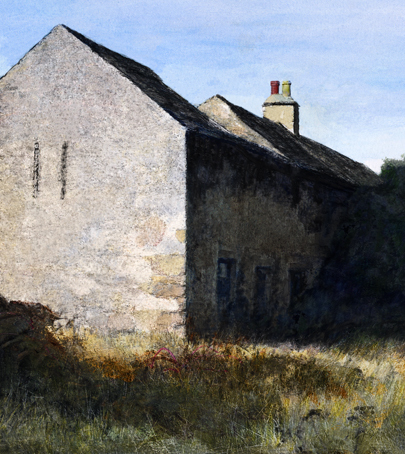 ‘Old Building, Scarlett’ is a much admired derelict. The lime rendered gable pitted to sublimely patinated beauty from centuries of rain, salt and sun is so mellow in this light. Not enough on its own but add the maps of old stucco, bleached sea of grass and briar lapping at a row of boarded up doors. Makes for a good picture in my books. 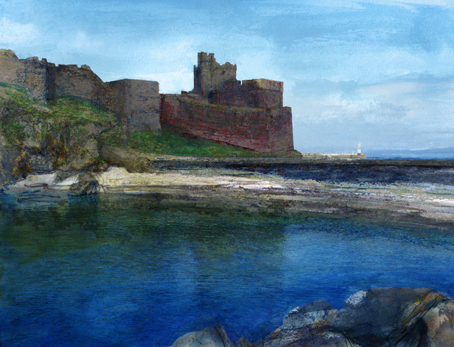 ‘Peel Castle’ from Fennella Beach side. Such a wonderful building is no push over when getting a handle on it art wise. The red of the sandstone and ink green of the sea standout in this rendition. Brings good ruddy colour to the place some say could have been the court of King Arthur. Still, a jolly good castle whatever! 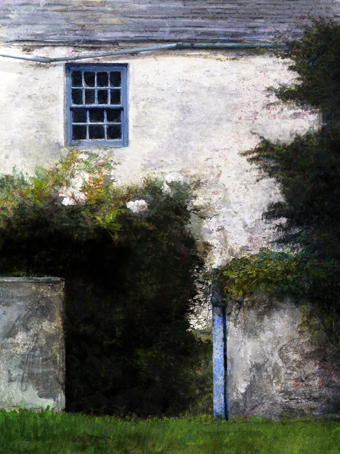 ‘Blue Gate’ is a cottage on a little triangle of land between two lanes up behind Ballabeg. If you want to place it take a right off the road to Ronague, up past Ballamaddrell farm. The map puts it at the apex of the triangle made by the previously mentioned forking lanes of upper and lower Ballavarkish. There is no doubt a name for it, but ‘Blue Gate’ suits the picture fine. 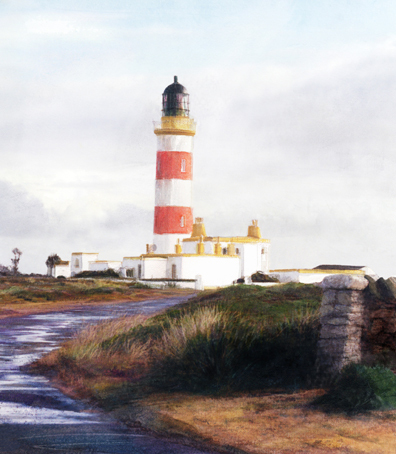 Last but non the worse for it, looking pretty as a picture, all sweetness and light after a shower and good dose of sunshine is the ‘Point of Ayre Lighthouse’. Very fresh looking. Lighthouses are great. NLB rocks! Shame that automation has seen off the keepers though. Well, that’s them. All the prints for a sneak preview as promised. Hope you like. 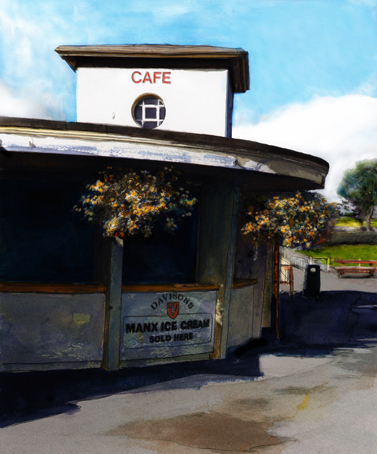 The Artist shop in Douglas is having an exhibition of my new Manx landscape prints. The show will run from Friday the 16th – Saturday the 24th of November. 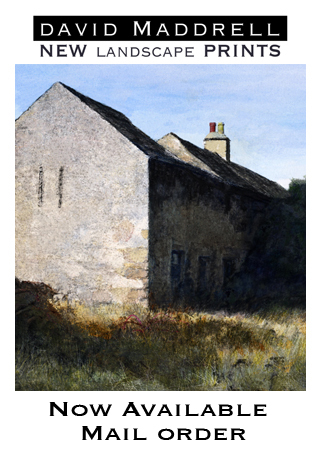 The prints are limited editions 1/10 and are only available from the ‘The Artist’ 37 Nelson St. Douglas. Tel 629851. Open 9:30 – 5:00 Mon-Sat. The print editions are very small making each one highly collectable. Images of all 11 of the prints will be posted on this site giving a sneak preview of the entire exhibition. Phone your order ahead or see the prints in the flesh at ‘The Artist’ from the 16th of November. You are currently browsing the David Maddrell weblog archives for November, 2007.